Malaga C.F. (club de futbol) is the local football club of Malaga City, currently playing in the Spanish first division “Primera Division - Liga BBVA”. 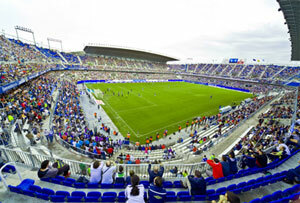 The club was founded in 1948, its home stadium is the Estadio La Rosaleda and the team’s typical colours are blue/white (when playing in Malaga) or green/purple/black (playing outside). Malaga C.F. stadium, La Rosaleda (The Rose Garden) is located at the end of Paseo de Martiricos next to the river Guadalmina. The Costa del Sol Trophy Cup, organized annually by the Malaga C.F. along with the town hall of Malaga, is celebrated on that stadium which holds approximately 29,000 spectators. La Rosaleda has hosted the official World Cup of 1982. The stadium also has hosted several concerts. Besides, the stadium facilities are used to house the official store of the Malaga Football Club, as well as a museum and guided tours are given through the facilities. You can get to the stadium in a few minutes if you get you car hire Malaga airport. Address: Paseo de Martiricos s/n - 29011, Malaga. Telephone: (+34) 952 10 44 88. Malaga C.F. official website: www.malagacf.com.